The closest thing I’ve ever had to a front porch was in my second year of college, from 1998 to 1999, when I shared a small three-bedroom house with my friend Leah in Westchester, minutes from LAX. We were among a few sophomores who lived off campus, so our house became quite the regular party spot. In the beginning, we had an older female roommate — a woman in her late-twenties with two dogs and a full-time job in Hollywood — but with all the impromptu parties I threw and noise I made, I drove her out of the house after just a month or so. While our backyard was pretty big and we spent a lot of time out there, our front porch — painted white to match the trim of the house — was my favorite place to congregate: to smoke and have a beer, to wait for friends who came over, and to watch people at the drive-through window at the combined Taco Bell and KFC across the street. We also lived steps away from the Fireside, a bar close to campus that accepted obviously fake IDs, as well as the Furama Hotel, another drinking spot. So we lived in a place that saw a lot of foot traffic, action, and mischief — all the time. That year was probably the best ever, and many things happened or came to be in that house. Close friendships solidified. Enemies were made. Love blossomed. Firsts of many sorts occurred. We were reckless and curious; we philosophized; we fought; we made up; we explored. Memories of my late friend Aki are strong on this front porch, and for this reason I’ll never forget what this house looks like. I’ve not lived in a house with a front porch since then and have forgotten what it’s like to have such a space. 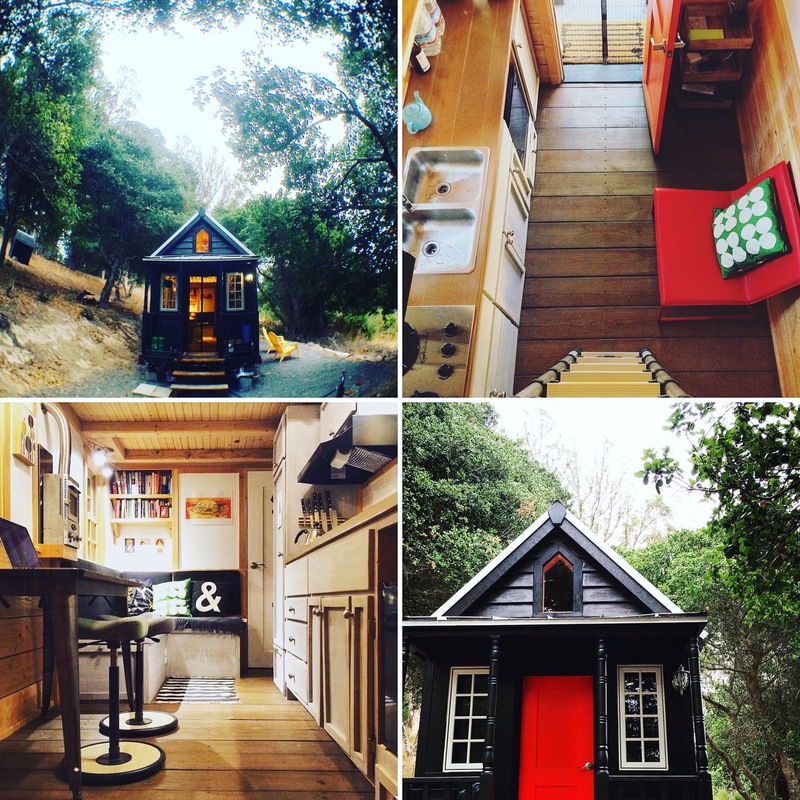 Because of this, I wasn’t initially attracted to tiny house plans with porches. Why waste the small amount of square footage you have on outdoor space — doesn’t it make more sense to make the most of what you’ve got for indoor shelter? Our tiny house, sitting in a yard in Sonoma County. Living in a tiny house will encourage us to spend more time outside, and we wouldn’t actually need a porch to do that. But there’s comfort in this transitional space that fuses public and private: where people come together and where things happen. In American history and literature, the front porch has been a rich symbol — perhaps more a state of mind than a physical place. Sure, this particular porch is on the smaller side — 7 feet by 2.8 feet, to be exact — but it’s a place that’s ours yet connected to the outside world. And it’s something we haven’t even had in San Francisco, living in one of many units in an impersonal condo complex in SOMA. People have porches in the Bay Area, but it’s not really A Thing — at least not in the way that New Yorkers have stoops. I grew up in a suburb of the San Francisco Peninsula, in a four-bedroom house with a long driveway and gate. You can fit more than ten cars in my parents’ driveway — that’s quite the buffer between the innards of our property and the public street. I’m not saying anything is wrong with this — in fact, I love my childhood home and am looking forward to staying there this year. But as I think about the types of houses I’ve lived in, what I enjoy, and what I miss, I understand why I’ve grown attracted to and have fallen for the Elm: it’s symmetrical and traditional, which speaks to the part of me that craves a sense of order and ownership; and also has a porch — a shared space that links the public and the private. There are a lot of things we can do on this porch: A place to read and play cards? A space to set up a hammock? An alternate place to write? An area for a small garden? We’ll see. I love our cottage home, but I absolutely adore our porch. We live out there as much as the New England weather permits, which is typically May through October. In the morning, with a cup of coffee and a book of poetry, it is a space for contemplation. Mid-day, with the laptop, it is a space to work while we savor the beauty around us. In the evening with a glass of wine, it is a space to watch falling stars and fireflies and share stories of the day. Enjoy! We don’t really do front porches in England, but I’ve always dreamed of having an American-style porch – if I ever have a house with space in front – or at the back – I’ll build one! A porch is to an American home what a terrace is to a French café. I dreamed of a home with a porch when I left Paris and my apartment with its tiny balcony. Here in California I have been living for the last ten years in a house with a porch. When I leave this house I will miss its porch more than any other room. A porch is a natural extension of a home. Regardless of its size I’m sure it will be your favorite room. To dream. To read. To pot a plant. To be outside and yet sheltered by your home. Happy porch times to you! I’ve yet to live in a home with a front porch, but I’ve dreamed of it, too, for so long. When I was in school for landscape architecture, the promise of “fostering community ties and neighborliness” was made by almost every student suggesting new urbanist front porches during midterms. (Much in line with the “if you build it they will come” mentality of those suggesting foodcart pods for every urban block in need of redevelopment in Portland…but I digress.) From wise professors’ feedback and personal experience on other friends’ front porches, I can say success comes down to the actual openness and effort inhabitants put into connecting with the space and with their surroundings. Sounds like your spirit’s in just the right place! So excited for you. I realize a lot of this “fostering of community” also depends on where exactly we park our tiny house — someone’s ranch or farmland? Far from neighbors? We have no idea at the moment (and that challenge, I suppose, is all part of the fun). Oh, how cool — thanks for sharing that. Nick will enjoy this as well (he loves tea). I agree — there’s something visual as well that draws you in. I’m very much a sucker for minimalist modern spaces, and the Mica model (the first on this page) attracted me very early on. That’s great that you just finished your renovation! Porches are my favorite place to be. The house I grew up in (in Georgia) has three, and when I go home, the porch is even better than the kitchen for congregating. Or for being alone. I go out there in the mornings when the world is silent and I watch it come awake, or we hang out on it in the evening while Dad smokes a cigar and we drink wine and cocktails. My husband and I don’t have a porch in our current home, and it drives me bananas. I want to sit out there and watch the world. I think you’ll love your porch – it is still sheltered space that will be part of your home, it will just be on the outside instead of the inside. With a porch you can spend time outside even when it rains, which is one of the best times to be outdoors. Also, I love that you wrote about porches 🙂 With spring coming you’ve made me want one even more. Yes, yes, yes — love the thought of going out in the mornings when the world is silent and watching it wake up. Currently, we have a huge window looking out into the street where we live — an alleyway our building shares with a number of other live/work loft buildings and an art school dorm. It’s, uhh, *not* the same. Some of the best moments in “To Kill A Mockingbird” take place on the porch. This is a place for reflection, reading, teaching, learning, and saying “Hey!” when your neighbors pass by. Congrats on the new home. While I’ve only read that book once, and a long time ago, I actually did think of it when I mentioned American literature. You’ve made want to reread it. “I was more of a back yard guy.” Yeah, I hear you — I love the privacy of a backyard as well — all the space for lounging and play. I miss that as well — hopefully where we end up parking our tiny house, we’ll have this kind of space!